Shiloh has been trash sober for 5 whole days. The first 3 days were due to us putting the trash on the counter. I got sick of that pretty quick. Let’s face it. A trash can on your countertop is pretty disgusting and not quite accessible ether. So Thursday I ventured out to find this Super Human trash can I was told about. 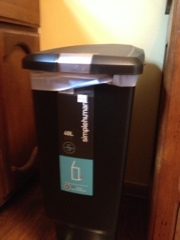 Lo and behold they actually make a trash can that is dog proof. Problem is….it’s freaking expensive. Thanks to Bed, Bath, and Beyonds weekly 20% off coupons I saved a bit of money on the worlds most expensive receptacle that will contain everything nasty from our house. Ridiculous. 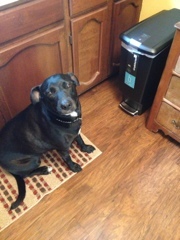 And since Thursday we have found the trashcan upright and the floor trash free when we come home. Thank God. Now, if we can just remember to always lock it. Mike’s still working on it. 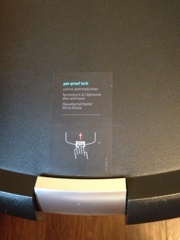 Maybe I should have bought the $140 trash can that locks with the touch of a finger. If this thing doesn’t work we are getting a new dog with that $140.